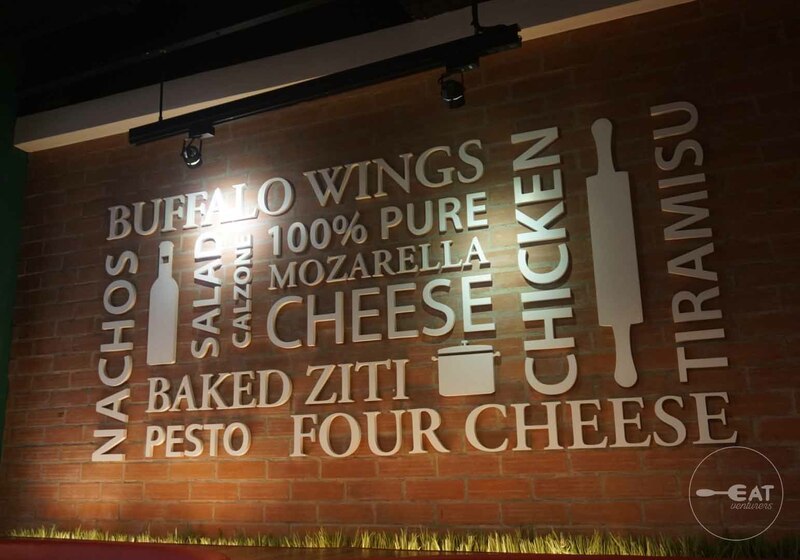 Don Henrico's offers a wide range of food choices: appetizer, salad, soup, calzone, triple gem, and dessert but they are known for their pizza, pasta, and chicken. The prices of food range from P48 to P2,900, are very reasonable as most food are for sharing. It is truly family-friendly and perfect for celebrating special occasions. Don Henrico's Homestyle Onion Rings (P190) is lightly breaded and golden crisp. It is kind of sweet and it complements the ranch dressing. This one is not as petite as it is named. It is actually big for mozzarella sticks. 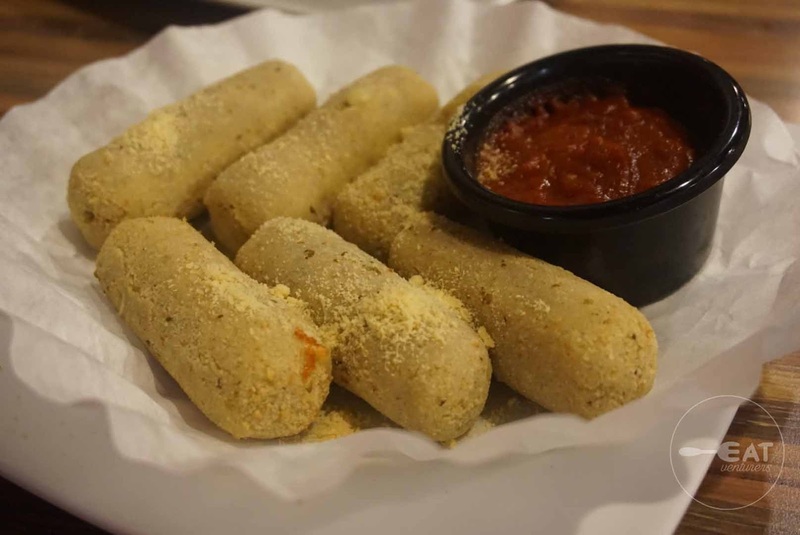 It is breaded in special Italian-seasoning, making it unique. Plus, it’s served with marinara sauce as dip. For salad, we tried their Oriental Chicken worth P260 for share and P440 for family. It has crisp lettuce with fried noodles and other toppings such as chicken, mandarin orange wedges, roasted honey peanuts, drenched in light sesame dressing. But we recommend Summer Salad, being sold at P310 for share and P490 for family. 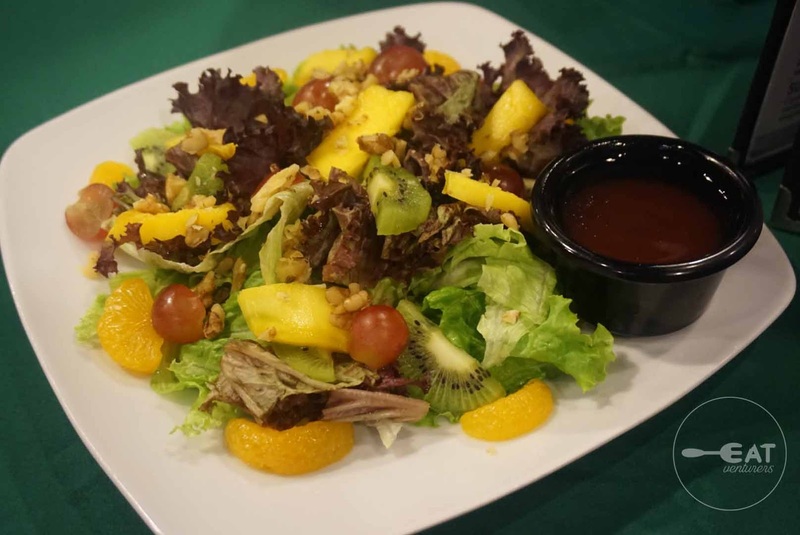 It is a combination of three crisp lettuce with mango, grapes, kiwi, mandarin oranges, and walnut, served with strawberry vinigrette dressing. Now, let's go to the best-selling pizza offered by Don Henrico's. 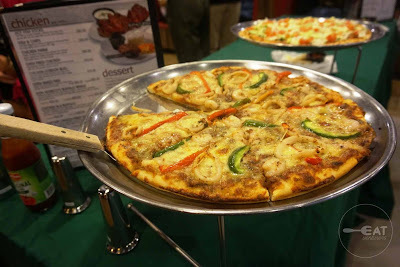 We tried three variety of pizza during the social night: Don Henrico's Supreme, Four Cheese, and Bacon Cheeseburger. Don Henrico's Supreme is the resto's signature pizza. They created it on their own and it's as meaty as we expected it to be. The toppings of the pizza include pepperoni, beef, ham, mushroom, pineapple tidbits, onion, bell pepper, and black olives. It is also reasonably priced at P360 for 10 inches, P650 for 14 inches, and P980 for 18 inches. The meat and toppings just balanced the taste. Verdict? We loved it. The Eatventurers usually prefer four cheese pizza to use thin crust dough but this one did not disappoint despite not being thin-crusted. 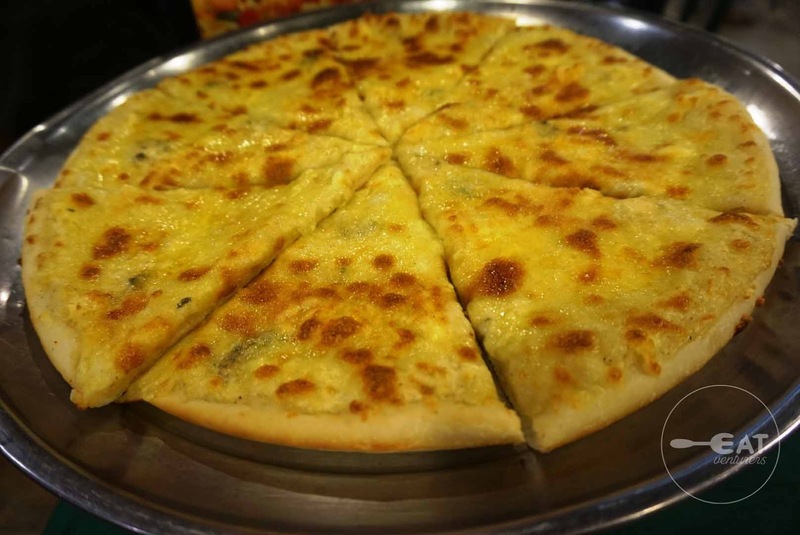 We were also expecting it to be salty because it is the combination of mozzarella, gorgonzola, cheddar, and parmesan cheese baked with Don Henrico's own bechamel sauce but it is not. The last pizza we've tried is their Bacon Cheeseburger. We were surprised with this one because although its name seems to sound meaty, the appearance of the pizza resemble a salad. It's topped with lettuces and tossed with mayonnaise and tomato. It also carries bacon, beef, mushroom, onion and pickles toppings. This is new to our palate because it is the first time we encountered it. 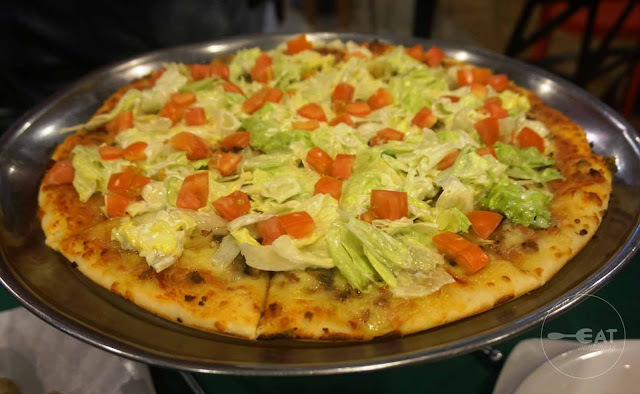 We found the lettuce overpowering the pizza but it is nonetheless good. 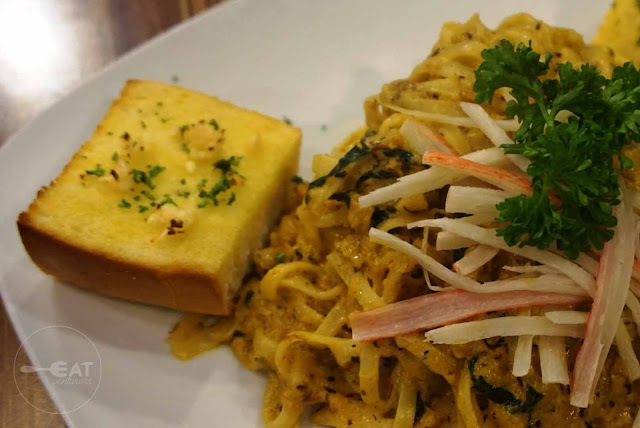 Now, let's jump to Don Henrico's flavorsome pasta. The Eatventurers tried their Tutto De Mare, Chili Garlic Shrimp Pasta, and their Crab Fetuccini Pasta, which we all loved. 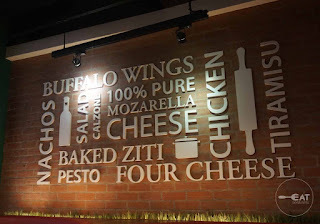 All are served with delicious garlic bread. 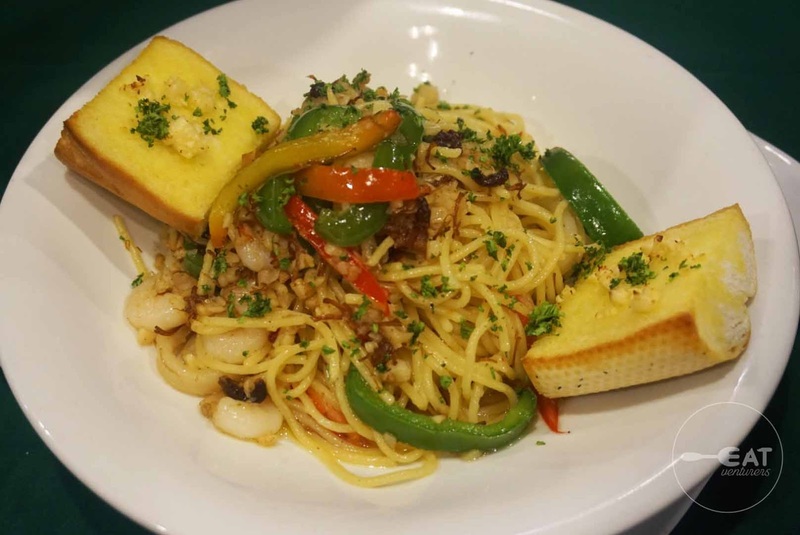 Tutto De Mare Pasta (P350 for share, P660 for family) is one of Don Henrico's bestsellers. Its toppings include shrimp, and squid, garlic, chili tomatoes and selected herbs in flavorful marinara sauce. They use linguine noodles for this. Indeed, this one‘s flavorful, somehow sour, spicy and sweet. 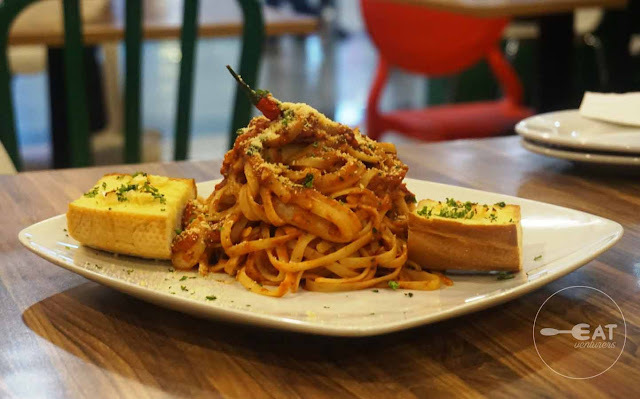 Chili Garlic Shrimp Pasta in Olive oil (P340 for share, P640 for family), on the other hand, is also one of the bestsellers. It is described as spicy spaghetti with shrimps and tomatoes cooked in chili-garlic olive oil sauce topped with whole parsley. The chili-garlic olive oil gave it a little kick that made it remarkable. 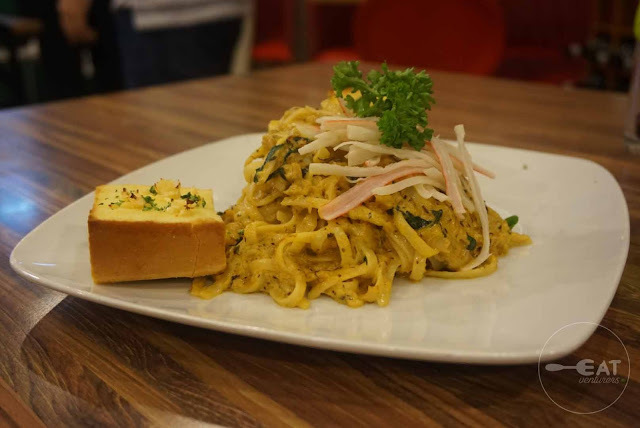 The last pasta we tried, Crab Fetuccini (P340 for share, P640 for family), is also something new to us. It is topped with flaked crabmeat, minced garlic, crabsticks and basil leaves. The crab meat is cooked in crab fat sauce, making it even more tasty. They used fettucine noodles for this one. Think curry or laksa, that's how this one tastes for us. 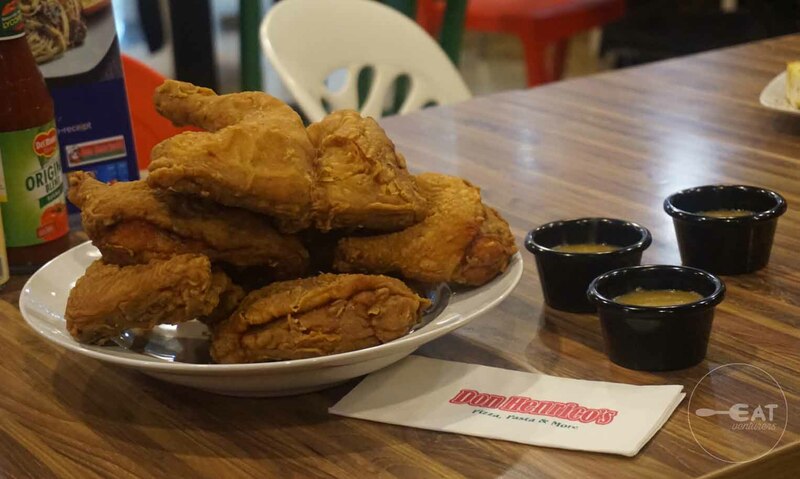 Lastly, Don Henrico's also served us their classic and are all-time favorite, chicken. 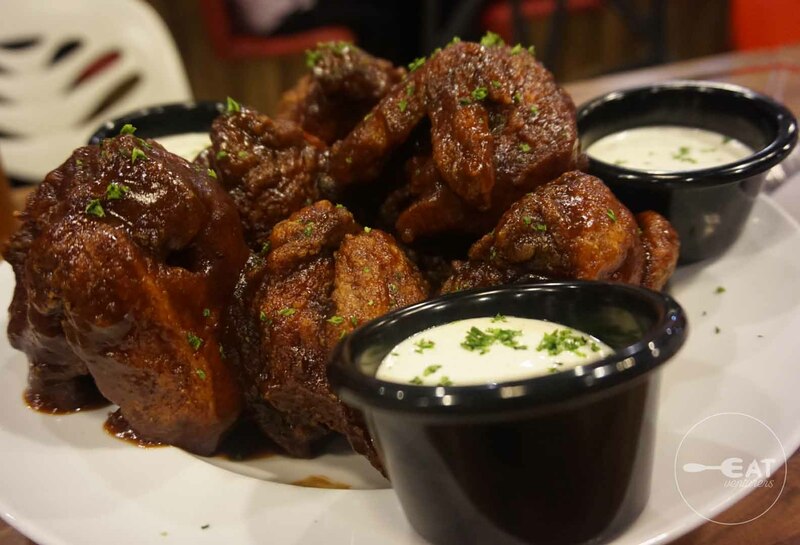 Now, we'd be biased on Don Henrico's Buffalo Wings because it is truly a must-try. It is huge and its taste is something you would crave and come back for. Don Henricos updated the New York style marinate for this one and it also has tangy BBQ sauce. It's sweet in a right way that you won't even need the ranch sauce that comes with it. On the other hand, the oven-fried chicken is healthier than your usual fried chicken because it is non-breaded. It is also served with gravy, and rice, as well as corn and carrots as side dishes. Who's the new brand ambassador? During the bloggers' social night, we were also introduced to Don Henrico's new brand ambassador, Richard Carvajal, author of The Millennionaire and is the president of Philgems Realty Corp. He is a frequent goer of the Italian resto. We used to think that Don Henrico's originated in West Avenue, Quezon City since it was the oldest branch we tried so far, so we were surprised to learn that it originated in Baguio City. 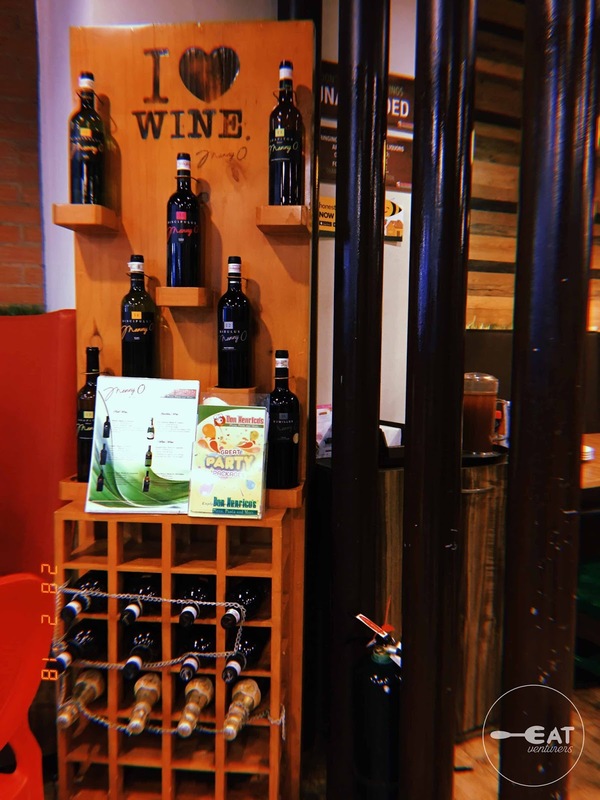 What's an Italian resto without wine? 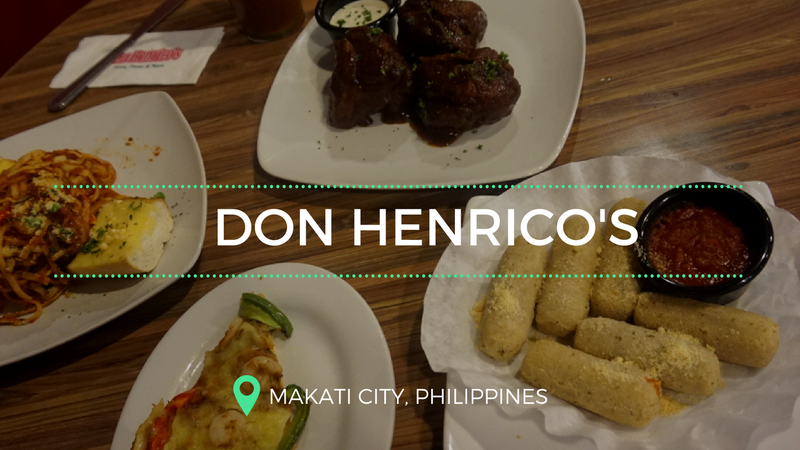 Don Henrico's is everything you need for your casual dining. 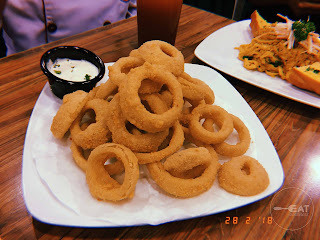 It has homey ambiance, offers food in large servings, and will definitely give value for your money but they also cater for your party needs. They still offer other food choices more than those we tried and featured. 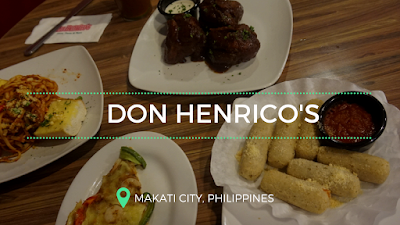 Check their menu in this link: Don Henrico's menu. If you are still not sold on these, do check out their new website coming soon at www.donhenricos.com.